This year’s remembrance of my brother Aaron on September 11th has been free, thankfully, of the national focus on the terrorist attacks that attended last year’s tenth anniversary. I don’t know what “everyone” is thinking about because I try to avoid the news for the few days on either side of the anniversary. But I could not help thinking about Aaron in the context of my triathlon training all summer and race this past weekend. Aaron ran the Boston Marathon in 1998, finishing in about 3:48. I drove him out to the start in Hopkinton and recall thinking that it took a pretty long time to get out there on the interstate, let alone to run all the way back. When I started training for the triathlon, I thought of it as primarily a challenge to myself to get more fit and continue to rebound from surgery earlier this year. I realized along the way that I also wanted to echo (however faintly) Aaron’s achievement, and to continue to honor the way he lived his life as best I can. I was also glad for the race, which fell on September 8th, to provide a positive focus for me and my family to counterbalance somewhat the dreadful buildup of anxiety and memories that starts for us each August. For me the main point here is not so much about athletic accomplishment, but about youth and the opportunity to develop your identity as you grow older. Neither Aaron nor I were ever celebrated as athletes, but did sports as just one aspect of our identities. 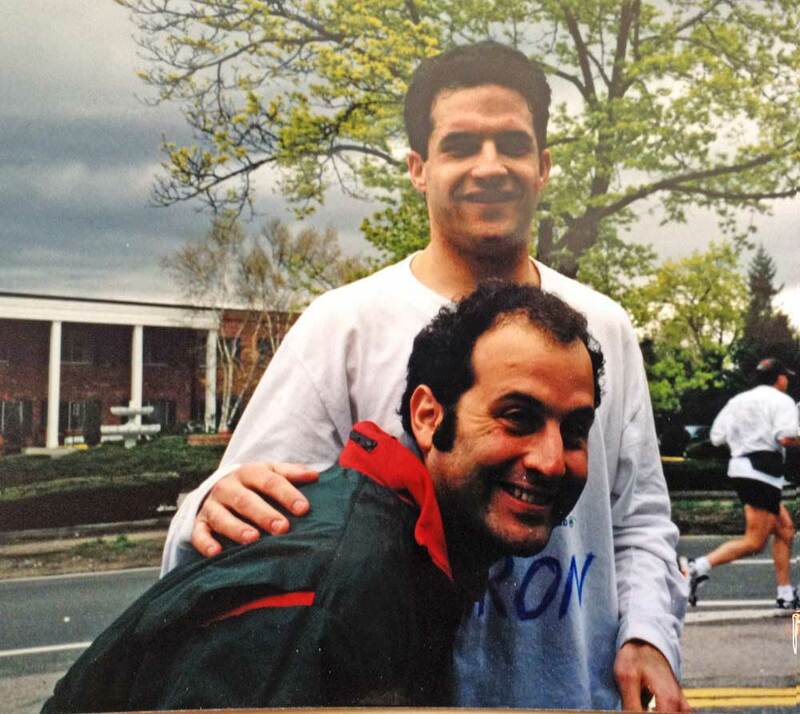 For him the marathon was not the grand fulfillment of an obsession, but a realignment of his life towards physical pursuits and away from the sedentary intensity of his job. The marathon complete, I don’t think he had set his sights on other big physical challenges, but surely could have taken them on in due time. But I no longer feel an inherent effacement of my own life, or of the world, because of Aaron’s absence. I feel instead the sweep of the rich, lived adult experience I have enjoyed since our lives together were snapped off at 32 and 27, and how cruel it is for Aaron that he could not find his own path into adulthood. My opportunity to take on my own limitations and fears and complete the triathlon–as part of the longer-scale ups and downs of working to keep my health–seems such a privilege to me as I contemplate Aaron’s foreshortened life, in which his marathon becomes now a kind of capstone achievement instead of what should have been the first of many, varied, self-defined triumphs. I came across this beautiful video recently in which Dutch people ages 0 to 100 state their ages to the camera. The guy aged 27 reminds me a bit of Aaron: he has an open, cheerful expression, looking as though he knows something about life but is still waiting to be surprised by much more to come. He is also so very young. Seeing the experiences written in the faces of the 73 people after him in the film brought home to me how much Aaron has missed. And how much I miss him. I wrote this poem last year at this time–my first complete poem about Aaron’s loss. I had big plans then to try and write more poetry in this new phase of my writing life, and perhaps seek publication. But while a bit more poetry has emerged, the vague idea I had of getting published — perhaps even as some journal’s seasonal poem in the early September issue — seems now both far-fetched and distasteful. Plus it remains a work in progress, though still the best I can do for now. I welcome your comments. And wood to spiral down like maple seeds. A grid-deck mezzanine above the street. His part among the chorus of escapes. This entry was posted in Uncategorized by jsjacobs. Bookmark the permalink.